50 years ago, people were perfectly happy being treated like a number. Employees were expendable and assembly line workers were interchangeable. If you expected to be affirmed by your employee, well, that’s what a paycheck was for. Today’s team members want to be valued beyond their monetary compensation; they rightfully expect to be treated with respect. Leaders can no longer be perceived as dictators. The days of the intimidating boss are fading and employees will no longer tolerate a company that undervalues their workers. In fact, most people no longer want to be seen merely as a worker or a cog in a corporate machine; they prefer to think of themselves as team members, vital partners, an important piece of the larger mosaic. Leonard Sweet says that, “people possess a desire for a higher purpose – a mission that will change the world.” By connecting with your organization, they can participate as a key component in a bigger mission. If you are a leader, you must connect in a relational way with your team members. If your organization is too large for you to offer hands-on care for everyone, you must structure so that someone is doing hands-on care for everyone. Individuals matter! Telling you what you want to hear. We must care enough to challenge one another to grow. Stretching is uncomfortable but a necessary part of personal and organizational development. Always agreeing. Just because I disagree with you does not mean that I am a “hater”. Sometimes my love for you compels me to disagree with you. Relational leaders care enough to lovingly confront when necessary. Presuming your leader to be all things to all people. We must have reasonable expectations. If your leader has 10 or more direct reports, she may not be accessible every time you need her. An extremely high capacity leader may be able to effectively connect personally with 50 or more people but you must not place them under extreme performance expectations as they relate to accessibility. Organizational acquiescence. While modern thinkers need to know they have influence, they cannot expect everyone to instantly comply and conform to their ideologies. Regardless of how impatient we may become, deep influence and trust takes a lifetime to earn. However, any leader that plans to remain effective must assume responsibility for building authentic relationships with their associates. People must know that they matter more than the organization. Regarding connectivity: as goes the leader, so goes the team. 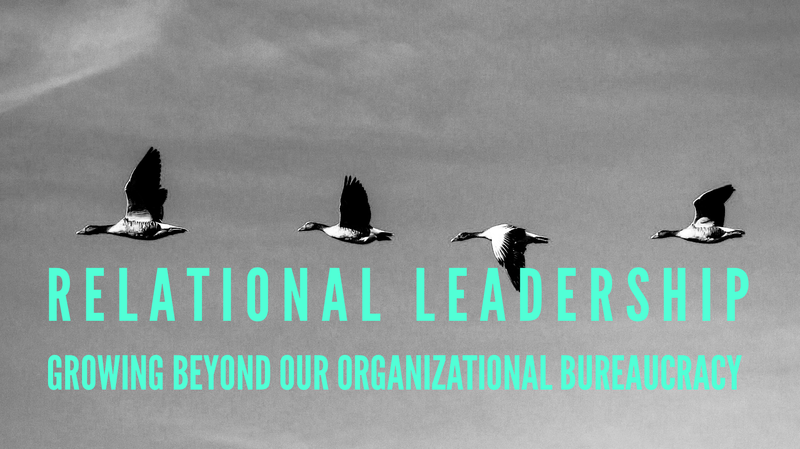 We must grow beyond our organizational bureaucracy. In order for institutions to continue to survive they must embrace a systemic relational ethos. If you find yourself in a leadership conundrum where morale is low but angst is high, try making more relational investments in the lives of team members. Strategically and intentionally provide emotional equity; let them know you care! You are important far beyond what assets you bring to your organization. Your value as an individual and friend far exceeds the contributions you make to the institution as a colleague, associate or employee. Relational leadership will affirm this over time. On a more personal note, the organization that I serve (the church) is experiencing great transformation in the area relational leadership. Much of our structure is being evaluated and adjusted. We have as our model, the Lord Jesus Christ. He always put people ahead of the institution. In fact, the purpose of His structure was to serve individuals. The church must lead the way in growing beyond our organizational bureaucracy and embracing relational leadership.